Frequent travelers like ourselves often find that one hotel blends into another when looking back on a year’s travels. When you recap your year of family trips, you don’t always remember the details of every place where you stayed. This is certainly not the case for us when it comes to remembering our fabulous five-star family vacation at Eau Palm Beach Resort and Spa. 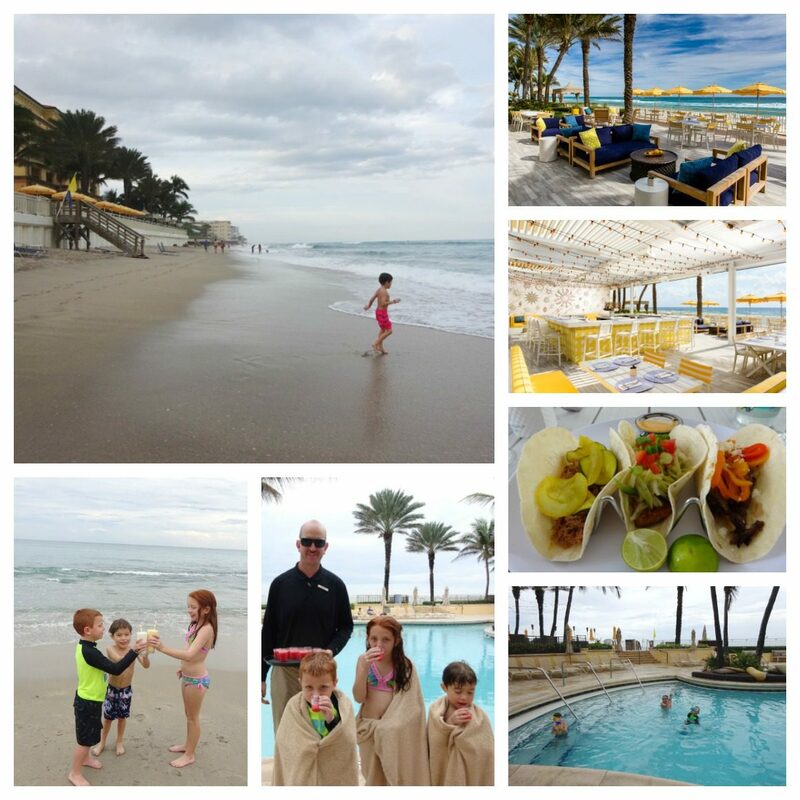 Our stay at Eau Palm Beach Resort and Spa was unforgettable for so many reasons. Most of all, we loved the playful style and personality of the resort and the outstanding service, making it a fantastic resort for families who want to have fun together and be well taken care of during their care-free beach vacation. 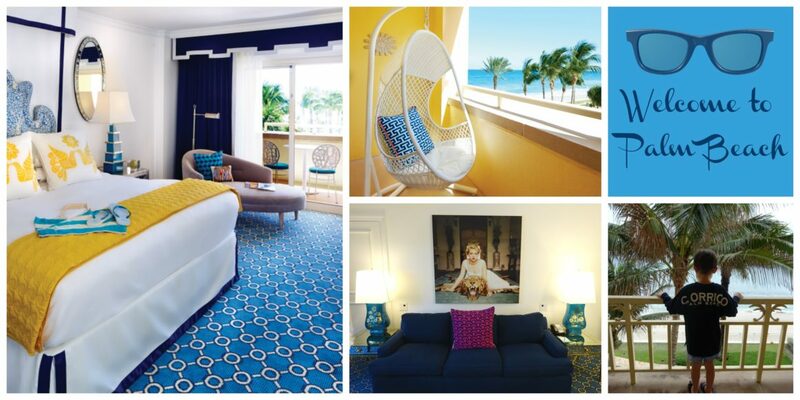 Eau Palm Beach grabs its clientele by all five senses and revs them up for a seriously playful vacation. From the moment we pulled up to Eau Palm Beach, we immediately grasped that we were staying at a more fun, fabulous, stylish, and playful five-star hotel than most. A welcoming bell staff greeted us curbside with flavored water and cool towels to wipe off the sweat of the hot day. At check in, the staff gave my husband and I champagne, while Harry received a map to go on a treasure hunt and explore the resort during his stay. The lobby is decorated traditionally with chandeliers and beach views, and the whole place has a fresh citrus scent that welcomes you. As we walked with the bellman down the halls of the hotel and towards our suite, we felt like we were at a fabulous party at one of the coolest spots in South Florida. We fell in love with the whimsical Jonathan Adler-designed flare of the hotel spaces. Our suite design was really outstanding. Jonathan Adler totally outdid himself creating the perfect interior of our suite to give us the feeling of living in a stylish Palm Beach home but with all the luxuries of a five-star hotel. The oceanfront suite sat right over the ocean and had a huge private balcony with super cool seating for us to enjoy the stunning ocean views. Inside, there was a large common area with a pull-out couch and a dining space. 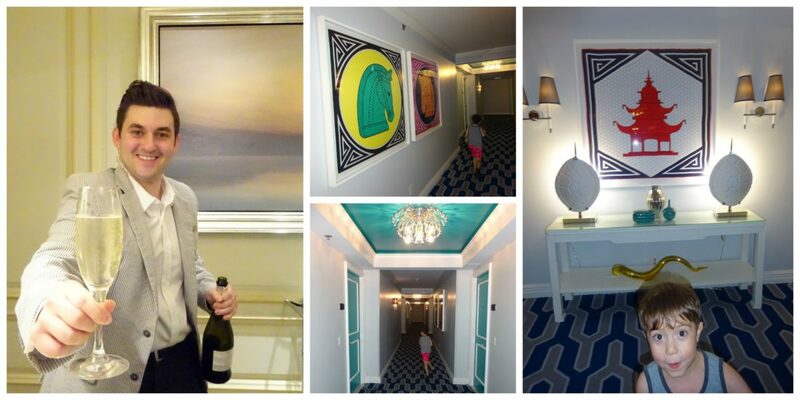 We couldn’t get enough of the cool artwork throughout the hotel—especially the photo of the woman and tiger in our suite. Our suite was perfect for family travel, and included two separate bathrooms complete with TVs built into the mirrors. We stayed on the club level, and our room included private club room access, which was awesome for our family. We grabbed complimentary breakfast every morning, snacks in the afternoon, and in the evenings we were spoiled rotten with deluxe appetizers, cocktails, and desserts. Every staff person we encountered in the club lounge was amazing, and each one remembered our names every time we returned. We had so much fun playing together as a family and exploring the luxe resort. The resort’s family pool sits directly in front of the beach, making it easy to enjoy a day playing at both. We spent our time going back and forth from the pool to the beach and relaxing in our poolside cabana that overlooked the beach. For lunch and snacks, we dined at Breeze Ocean Kitchen, the hip and casual pool side restaurant. We fell in love with the fresh mahi mahi and grilled shrimp tacos. Harry was a big fan of the kids chicken tenders meal. Every afternoon we ordered milkshakes to take down to the beach for Harry and his friends, along with heavenly spiked milkshakes for the adults. I signed Harry up for a morning full of activities at AquaNuts kids club because I wanted to relax at the resort’s amazing award-winning spa. AquaNuts offers full- or half-day entertainment for kids ages 5-12. The talented staff immediately engaged Harry, as did the underwater-themed club complete with a pirate ship and a treasure chest full of costumes for dress up. We toured around the club and explored all of the offerings—from a climbing reef to a sand castle stage for performing in costume and an awesome movie theater area. Since there weren’t a lot of kids there on the morning of Harry’s visit, the staff toured us through to the connected Coast teens club that caters to teens aged 13-17. Coast had an awesome surfer vibe for teens complete with a beauty salon, DJ booth, Internet cafe, games, TV areas, and a dance floor. Harry loved the DJ booth and had a blast mixing his favorite tunes for everyone on the dance floor. While Harry was mixing beats at the kids club, I headed off to the Forbes Five Star Eau Spa for one of my most memorable spa experiences ever! A day at the 42,000 square foot Eau Spa is magical and whimsical from start to finish. I was a lucky duck to spend a morning alone enjoying being pampered at such a luxurious place. Click Here to Read all about the Eau so Fabulous Eau Spa! I adored every minute of my spa time and Harry loved his time with the awesome staff at AquaNuts. Next time we stay we will absolutely plan for him to go enjoy full day at AquaNuts so that I can splurge on additional treatments and spend a full day relaxing at the spa! In the evenings, the hotel takes on a fun night vibe. A DJ spins tunes in the lobby, and the front living room with views of the ocean transforms to a hip night club. It was a fun place to socialize for hotel guests and locals. We loved starting our nights by grabbing appetizers and cocktails in the club lounge. Every night, the staff cooked up something new. Our favorite was a delicious sautéed gulf shrimp with mango salsa. After appetizers, we would head over to either Palm Beach or Delray Beach for dinner. The hotel is conveniently located between the two towns. After our dinners, we returned to the club lounge for a nightcap and dessert. It was a perfect end to a day well spent. We loved our stay at Eau Palm Beach so much that we wanted our home to smell just as good as the resort. So before we left, I purchased some of the custom Eau Palm Beach scents from the hotel gift shop, and each time I smell it at home, I think of the amazing, relaxing vacation we spent at the most playful and memorable luxury resort in Palm Beach. We can’t wait to return to Eau Palm Beach next year for more. 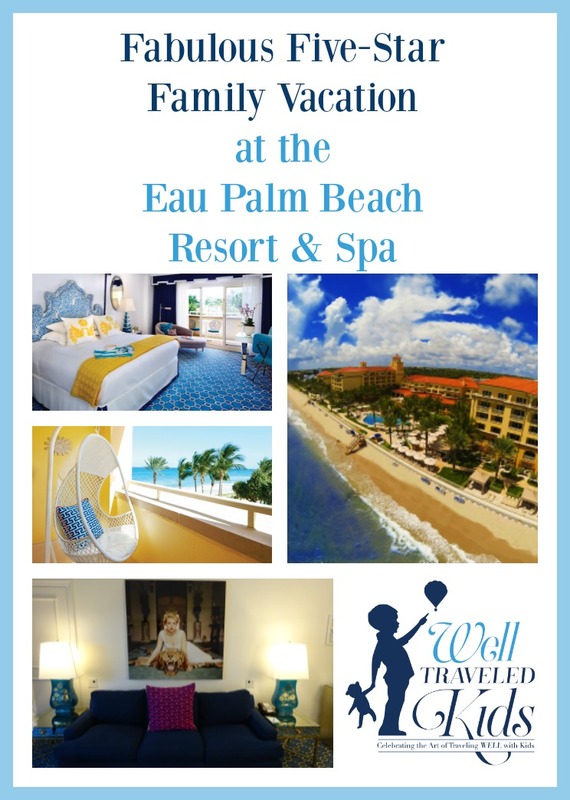 Planning a stay at Eau Palm Beach Resort & Spa? Pin this for later! Thanks to Eau Palm Beach Resort and Spa for the discounted media rate for our stay. We had a blast and can’t wait to return for another sensational visit.